Maryland writer Dara Carr is the author of the novel Angela Cray Gets Real, a Freddie Award finalist. 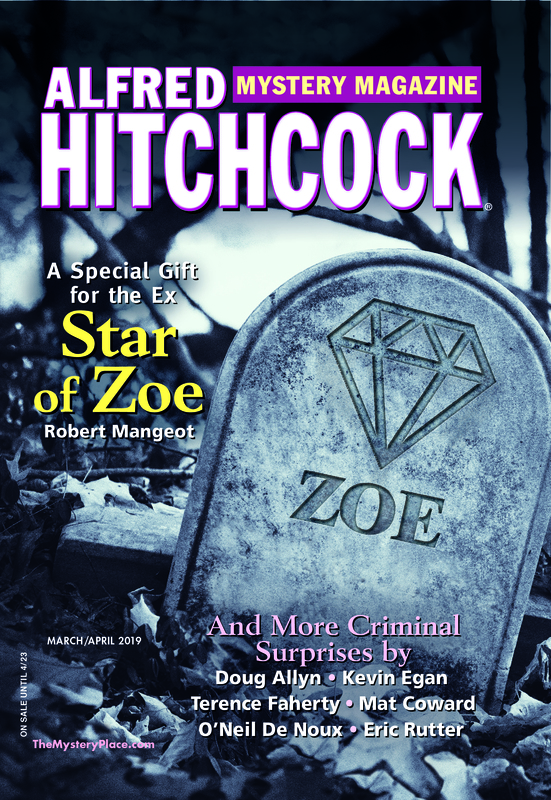 Her short fiction can be found in Shotgun Honey and Ellery Queen’s Mystery Magazine. Here she talks about the road to writing and publication of her clever and compelling story “Off-Off-Off Broadway,” from the current March/April issue. The story, “Off-Off-Off Broadway,” was born in the wrong time and place. It began life as part of a disastrous first novel. Among this novel’s three hundred some pages of dreck, I retained a fondness for two characters, an ancient bulldog named Winston and a former beauty queen from Oklahoma. Not being prone to waste, I wondered if I might resurrect these two in a short story. And, just like that, an awful idea came to light, which I persisted with through many twists and turns. The early junk novel had a photographer in it, as does the story, “Off-Off-Off Broadway.” But the novel’s photographer, a wiseacre with a bad attitude, wouldn’t join the story’s cast. I needed a different type of photographer, one who took up less oxygen, one who could bring a wry perspective to the unlikely drama the combustible former Miss Oklahoma would inevitably provoke. This was how I started with two women and an elderly bulldog in a photography studio. The next obvious question: What could possibly go wrong? Determined to find out, I poked and prodded, exploring the possibilities for disaster. As I did so, the story became an odd but welcome mental escape from the terrible events unfolding in my personal life, where my mother was losing a battle against time and multiple illnesses. Eventually, through a fog of grief, the story took shape. Hurrah! With the story finished, my focus returned to my job, another novel, and the bureaucracy of death. Some while later, I realized the story still felt unresolved. At the same time, the sight lines through it were too clear. This was more koan than critique but nevertheless I set to work tinkering again. Once more, the story crystallized. Done. Flash forward several months when, around bedtime, further changes to the story came to me. Bam! This was it, the fullest realization of the characters and plot. I couldn’t push the material any further. The end. Finally. Unfortunately, the story was already in the submission queue at AHMM. After a quick investigation, I realized I couldn’t tiptoe into the system and quietly retract my story. I would have to issue a manufacturer’s recall. And I would have to do so knowing that writers, especially newer ones, were constantly being advised to never submit a piece until it was ready. How do you know when a piece is ready? If the reader experiences twists and turns with a story, it’s quite possible the author experienced them as well, just earlier and in slower motion. In the case of my story, much slower motion. After putting the final touches on the final version of the story, I reread it again with the distance of time. It struck me that every character in this story, my escape hatch from grief, was dealing with some form of loss. And thus, this piece had one last twist to offer up. Many of the crime stories in our March/April issue involve movement—a chase, a hunt, an escape—and each follows its own twisty journey. Dale Berry offers a graphic story of raw ambition in “The Trail;” a young pickpocket and a grave robber team up to travel a dark path in pre-revolutionary Paris in R. T. Lawton’s “The Left Hand of Leonard;” Bill Pronzini and Barry N. Malzberg give us a tale of a grieving husband and father who seeks to atone for a tragic lapse by becoming a “Night Walker”; and a young couple on the run is fatally drawn to a roadside carnival in “Fair Game” by Max Gersh. Sassy Las Vegas stylist Stacey Deshay returns with a special assignment for a comeback star only to discover that her road crew has another agenda in “Knock-Offs” by Shauna Washington. A portrait photographer’s session with a beloved pet develops a negative aspect in “Off-Off-Off Broadway” by Dara Carr. A spouse-sitting assignment gets complicated for Ecuadorian P.I. Wilson Salinas in “Los Cantantes de Karaoke” by Tom Larsen. Many and varied are the paths that lead to criminal behavior. Leave it to AHMM to steer you straight.